Last week’s LinkedIn IPO created quite a stir. Not only was the financial services industry on display, as the bankers bought low and sold high within 24 hours; but pundits also began wagging about the Second Coming of the Internet Bubble. There are about 10 Internet companies in line to bring out IPOs. Zynga, FaceBook, Pandora, Renren, HomeAway, Groupon, Active Network, Skype, Trulia, Viadeo, Kayak, and Tudou. Experts are predicting a banner year for IPOs. This exuberance is, supposedly, going to be rational this time. The irrational kind of exuberance that created and burst the Internet Bubble in 2000 won’t be repeated, the ‘experts’ say, because we understand bubbles better now. Really? Somebody should tell the housing market. Internet Bubble I, which burst in 2000, was generated by the investment banking and financial services industry creating over-inflated stock values in Internet-related stocks. The Real Estate Bubble, which is still bursting on people, was generated by the mortgage companies and banking/financial services folks creating over-inflated mortgage paper. Both were ‘exuberances’ of profit-taking for the financial institutions. This new Internet ramp-up could in fact be the first positive macro market event since international melt-down started. Internet companies can jump-start the overall recovery. The 10 big IPOs coming, as well as the tens of thousands of other Internet companies, can sustain accelerating valuations, especially if they match product performance with solid customer service. Each year we work directly with hundreds of realtors–both brokers and agents–concerning Internet Marketing and Lead Generation. Each year NAR publishes a Technology Survey. That’s where that 87% number came from a couple years ago–87% of the potential home buyers were searching for homes on the Internet. 2010, 16% of the respondents had not done ONE DEAL in the last 12 months! So, one needs to use such global survey data with a degree of caution when it comes to serious decisions like how to spend marketing funds in a brutal market…like now, in other words. During the last three-four years the top 12-18% of the realtors have continued to complete successful volumes of transactions and invest in marketing. Dollars have moved rapidly from print advertising to Internet Marketing. Brokers and agents who understand that Internet marketing is not a passive, do-a-website, post-my-listings, and they-will-come, kind of process, are generating outstanding lead flow and return on investment for their marketing expense. These realtors actively engage with work that improves SEO. They also know how to use IDX searches on their own websites to drive traffic and leads. In a counter to the good returns being achieved by some realtors, most realtors have squandered time and money with website providers. We rarely encounter a broker or agent who has not had an unfortunate past (or current) experience with a web provider. Tales of over-priced, under-delivered websites; lost money on pay-per-click (PPC) programs; long-term contracts with penalties for early termination; SEO scams; abound–but, still the serious competitors have pushed forward. The range of technology knowledge, experience, and patience, among individual realtors is extreme. A significant portion–my best estimate is 20-30%–are still on realtor.com and aol.com. In the next group up, agents who use the MLS to search for homes for buyers and then email them the property detail pages. These realtors tend to have websites, and are still surprised when one of their buyers finds a property on their own, searching on the Internet. They should be thankful that the buyer called them back. (Buyers today increasingly want to have control over their home search. They enjoy home-hunting at odd hours of the day, when they can fit it in.) This second group comprise another 30-40% of the industry. The third group (so the market has three basic segments) use their web presence to attract buyers and market sellers. They provide the buyers with an effective IDX program, to be able to search all the listings in the MLS, and so the realtor generates leads on all the listings, not just their own. Lower Third: Clueless. Some of these folks have the good fortune to be working with an effective web provider, and may have nice sites. Middle Third: Have websites, but don’t actively push traffic, don’t refer buyers to their own IDX search on their own websites, don’t understand keywords, or how SEO works in general. Top Third: Actively drive traffic to website that features a leading customer-friendly IDX search. Uses blogs, reciprocal links, and organic SEO programs. Updates website regularly. Features own listings as a benefit for sellers, achieves non-listing lead generation that provides a positive return. Segment Size Possibility: In an industry where some pundits say the 80/20 rule is really 90/10, with 10% of the players generating 90% of the revenue, the Top Third could be smaller–as much as 15%–and the other two categories could in turn be larger than a third. Marketing a service is different from marketing a product. A product can be demo’d, it is tangible. Service is a promise to deliver, an intangible. Service companies can demonstrate how many trained people, how quickly they respond, how long it takes on average for them to fix the problem, how often you’ll need help per year…but, service is manufactured daily in front of the customer. We recently needed to develop a marketing collateral piece, requiring content and images. Which comes first, the content (message) or the image(s)? What’s the “best practice” for the creative process? 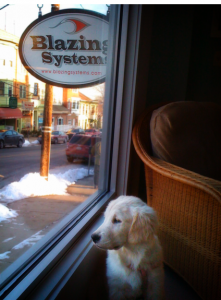 This is Chloe, a developer-in-training, staring out the window in the office this winter. Check out the postcard that was created on our website. When it comes to the question of which comes first, with image & content it’s the same as with the chicken & egg–It doesn’t matter, as long as you get one or the other to start.